A lovely blue-coloured glass with gorgeous ribbed glass design, this vintage style votive comes complete with a simple wire handle. 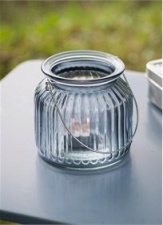 Add candles or tea lights to make an elegant addition to your lantern collections. The beautiful blue hue matches seamlessly with a range of decors and would look lovely lining the dining table indoor or out, on a windowsill or bedside table. A perfect way to add that subtle soft lighting to the home.